By Right Reverend J.D. Richards, D.D. Originally printed by Benziger Brothers in 1884. A Plain and Brief Statement of the Real Doctrines of the Roman Catholic Church, as opposed to those falsely attributed to her, by Christians who reject her authority, and by Unbelievers in Revelations; that thus a contrast may be easily drawn between the “Faith once delivered to the Saints,” and the conflicting theories, and scientific guesses of the present age; and serving as a refutation to the assaults of modern infidelity. 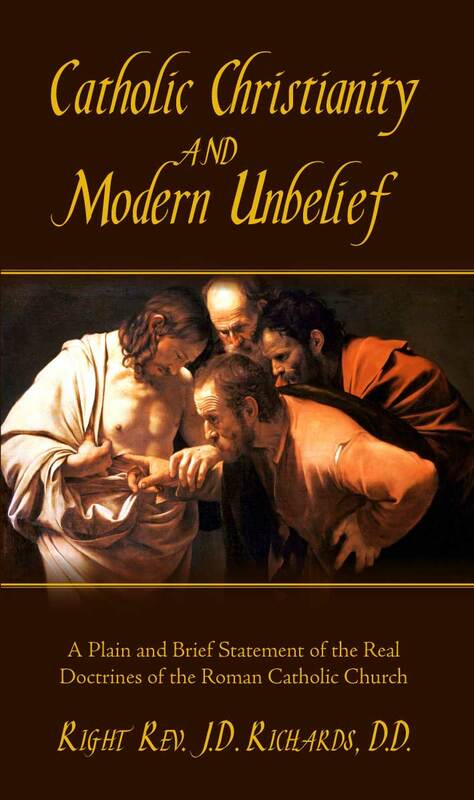 From the introduction: I believe that no one of ordinary intelligence and observation will deny that unbelief, the offspring of frivolity and thoughtlessness, is rapidly spreading over the whole civilized world. It is not philosophical and reasoning Infidelity that is causing whole nations, in this nineteenth century, to turn away from God and His Christ and the hopes of Faith, but thoughtless and flippant ridicule of the joys and terrors set before us by revelation. It is utter carelessness and indifference about sacred things that is doing this wide-spread mischief. From the preface: [The] object has been throughout to state the difficulties urged by unbelief against Catholic Christianity plainly and even forcibly - much more forcibly than they have been put to me by travelling companions, and men whom I have met, disposed chiefly to common-sense, and are supported, on account of their simplicity, from hosts of others more suited to the schools.